by Roger Phelps, promotional communications manager for STIHL Inc. I was in Honolulu last month where I represented STIHL Inc. in our ninth year sponsoring the American Farm Bureau Federation’s (AFBF) Young Farmers and Ranchers (YF&R) Awards. 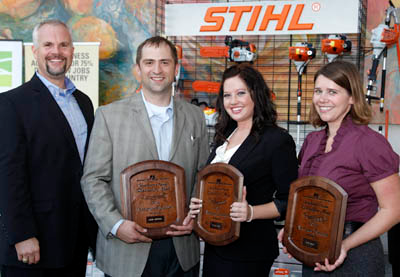 STIHL sponsors the Achievement Award, Discussion Meet and Excellence in Agriculture competitions which recognize farmers between the ages of 18-35 who demonstrate knowledge of and achievement in agriculture and commitment to promoting the agriculture industry. 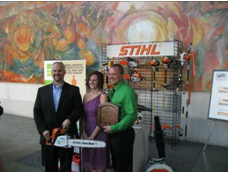 As part of our sponsorship, STIHL presented the three runners-up in each competition with an MS 290 STIHL FARM BOSS® chain saw and a $5,000 U.S. savings bond. As a family-owned company, STIHL understands the significance of the Farm Bureau and the impact these young family farmers have, not only on our local communities, but the country as a whole. It’s important to help spread that message, and that’s why we continue to support these competitions. The dedication, passion and enthusiasm shown by these young farmers and ranchers inspires us and reminds us that the future of agriculture is in great hands. Attending and sponsoring events like this also allows us to interact directly with people who are using our product and hearing first-hand what they think of our products and how they are using them. 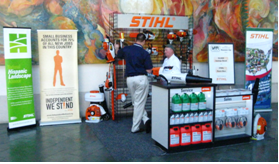 By gaining insight from such groups, we are able to help our customers use the STIHL products to the best of their ability. We’ve heard from several of the winners in the form of thank-you notes, letting us know that our sponsorship is truly making a difference. 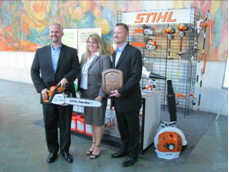 Personally, I’m always very touched to hear what these awards mean to the winners, and I’m very proud to work for a company such as STIHL that supports such accomplishments. “We have learned so much and gained lifelong skills by being active in the Young Farmers and Ranchers program...and we are really enjoying our chain saw!” –Travis and Renae Gebhart. The Achievement Award recognizes young farmers and ranchers who have excelled in their farming or ranching operations and exhibited superior leadership abilities. The Discussion Meet simulates a committee meeting in which active discussion and participation are expected. • Chelsea Good of Kansas. The Excellence in Agriculture award recognizes young farmers and ranchers who do not derive the majority of their income from an agricultural operation, but who actively contribute and grow through their involvement in agriculture, their leadership ability, and participation in Farm Bureau and other organizations. For more information on the American Farm Bureau, visit www.fb.org.